Miniature Costumed Porcelain Doll - Rebecca. Rebecca wears a tailor-made suit, made of silk which lends itself beautifully in producing soft elegant lines, I designed the outfit to fit like a glove. The suit consists of a straight line hobble skirt, a jacket and a crisp white lacy silk blouse. Hobble skirts from the Edwardian era were severely limiting since they tapered down to a very narrow opening just at the ankles. 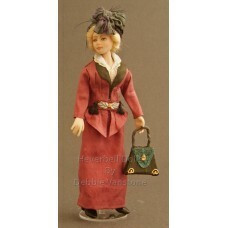 The hat is embellish with a huge silk bow and feathers typically befitting this era. Rebecca carries an attractive bag, the black handmade shoes finish the look. Her hair is made from viscose. Under garments are worn. This doll is made from porcelain with a soft lower body, soft upper arms and also the tops of the legs are soft. Rebecca is approximately 5½”in height 1⁄12th scale i.e. Dolls house size.